Flavor King is a pluot® - an inter-species cross between a Japanese plum and an apricot (but more plum than apricot). The general appearance and flesh are indeed typical of a Japanese plum, as is the smooth skin. The flavour is essentially that of an intense plum, but there is a sort of syrup-like smoothness that you don't normally find in a plum. The apricot seems to lend an almost gage-like flavour to the otherwise characteristic bland sweetness of Japanese plums, and there is also a hint of peardrop. The blossom appears very early in the spring, and the flowers are somewhat larger than plum flowers. Please fill in the details below and we will let you know when Flavor King japanese plums are back in stock. Flavor King is in flowering group 1. Flavor King is self-sterile and needs to be pollinated by another tree of a different variety nearby. Flavor King is only really suitable for growing in the south-east of the UK, because it flowers very early in the spring. Flavor King is not self-fertile and needs to be pollinated either by another pluot or by a Japanese plum variety such as Methley or Santa Rosa, or by an early-flowering mirabelle such as Countess or Aprimira. It is possible that common early-flowering hedging species such as Myrobalan (Prunus cerasifera) or Sloe (Prunus spinosa) will also pollinate it, and possibly Jefferson gage, which is very early flowering. It is a naturally precocious variety and, assuming there are pollinator trees nearby, is likely to start fruiting in its 2nd or 3rd summer. Plumcots (which are 50% plum and 50% apricot) were first raised in California in the late 19th century by the famous horticulturalist Luther Burbank, however they were not particularly easy to grow. In the 1980s Floyd Zaiger of Zaiger Genetics started breeding plumcots and then further crossing them with plums. He registered the word "pluot" to describe any inter-species plum/apricot hybrid which was more than 50% plum. Flavor King was one of the most successful of these new hybrids. Despite the company name, Flavor King is not a genetically modified or "GMO" variety - like all pluots it is basically a plum-apricot cross which is then further crossed with another plum. The variety name is sometimes mis-spelt as Flavourking in the UK. 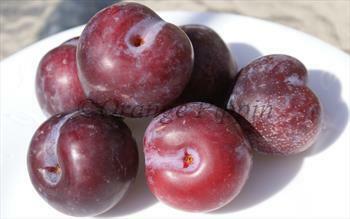 There is also some confusion about plumcots vs pluots. Since Zaiger Genetics had registered the word "pluot", other growers came up with other names for plum / apricot crosses. For this reason Flavor King is sometimes (and perhaps incorrectly) described as a plumcot.